There’s something interesting happening downtown at The Armoury New York. They’re building a team of chic and, more importantly, cool young guys that seem to have a good sense of style and youth. I’ll be very curious to see how the shop and the team evolve over the next few years. New York could use some fresh blood in the stuffy tailored clothing arena. Somebody hep me. What is that coat. Rico – the coat is by a new Japanese brand called Coherence, it’s available for purchase at The Armoury though it might be sold out now. I think whatever you did with the photo background is pretty interesting. the forms look a bit abstract and graphic. it definitely makes the young man pop out. Wow! this is an awesome look! It’s fun and youthful, it shows that you have style and masculinity. At the same time it never forgets it’s classic background. Everyone woman loves a man that can dress. Like to think the winter coat belongs to the man’s papa or granddad, beautifully kept and passed down! He’s very dashing! Love his wavy hair. Marvelous color uses. I recall you pointing out seeing forest green on the streets multiple times in Paris recently. It marries very well with the 2016 Pantone colors which feel to me like sunrise over cool water. Was the coat mottled forest with brown or a shade between olive and forest with brown, or both greens with the brown? It seems more like the first when i enlarge it. There are many other neutral and darker colors with which the 2016 Pantone shades mix well, as well as them having the ability to swirl refreshingly with any shade found in a sunrise or sunset, so I suspect there will be street fashions with a number of combinations normally seen in nature, with people watching the sky more as well as beach combing for some shell and pebble colorations and yet more views of the natural world for inspiration toward new combinations. even if the style is great it should be great for you!!! He doesn’t look old at all. He looks like a gentleman in quality classic clothing. How do you think he should be dressed for his age? I’m with you, Debbie! If I was a young woman in has age group, I would be so proud to be out on the town with him dressed like this. Classic, sharp and dignified. This is a 5-star look! What I love most about this photo, though, is that the subject is smiling and looks like he’s having fun. That makes the clothes attractive…not the other way around. I am his age, and female, and I am here to tell you that he looks hundred times more right then some dude wearing skinny hipster jeans, and a hoodie. He looks hot. A very fresh sense of style! I really like his tie. I appreciate that it is not a trendy skinny tie, but fuller and expertly tied. In fact he does an outstanding job of dodging any trite trends (skinny, over-tailored sleeves, etc.) but rather wears his outfit in a traditional, proper fit. I like the emphasis on fabric texture rather than obvious, bright pattern. very nice, high quality fabrics (or good photo), for the tie and coat. Love the tassels of the scarf coming out of the pocket too and how it all ties in together, not only colours but shape. This is an altogether very good look! I would deffinately notice this young man if I passed him on the street. And Ohhhh…. I love that tie. It’s kind of… Umm…. “drapey”. Precisely because he is a young man he can wear clothes that would seem older in other people. It can be elegant and even funny.And if the coat is from his father or grandfather (I don’t think soo.It’s too new)then better and better. Love how the simple, monochromatic tie stands out. Beautiful! Beautiful tie. Love the cut, color and that it’s wool. Beautifully put together.. right down to every detail. It’s refreshing to see a well dressed and groomed young man. He’s very good looking.. I did visit The Armoury yesterday following Scott’s post. Unfortunately I didn’t have a lot of time so I quichly went through their offer of products. All of them from top brands, accessories (Ettinger), shoes (Carmina), eyeglassess and clothes. Everything looks very nice (and very expensive). The clientele must be long to a niche. I would like ti go back with more time and explore better. This is BEYOND perfection, and his hair is divine!! This fellow looks fantastic! I wish all men would dress like this. Glad there is no man-bun in sight. Totally 100% boring look. Looks like an uniform. You’re absolutely right Scott! Take a bit time to browse through their instagrams! This man is the prove that the Ginger man can be the best looking man. 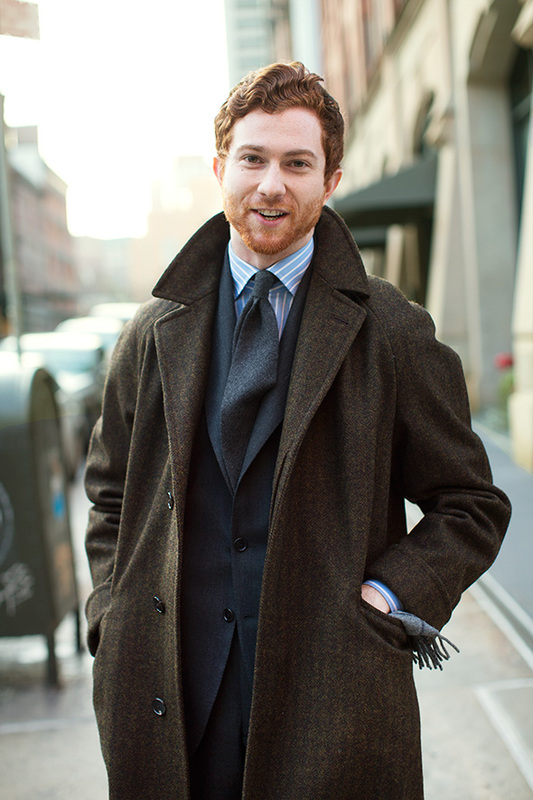 Most important for the Ginger is to wear toned down colors. Someone told too many Gingers to wear very bright red and very bright greens but that isn’t the best colors for them. This Ginger wears the best colors. He is very smart or very lucky to have the full beard since Gingers have such pale white skin a beard is good for giving richness to the face. Also I looked some more and this man might be the brother of my favorite actor Connor Maguire. They really look like brothers! I really like his tie and jacket! The Armoury, Hong Kong, is worth a look too if you are in town. I really like this gentlemen’ outfit, and all in this pic fits, from the colour of his hair to the dark grey tie, absolutlety awesome! Voilà une mise comme on aimerait en voir plus souvent sur le site. Elégance décontractée mais très stylée. Très belle cohérence des formes et des matières à base de laine, de cachemire et autres étoffes duveteuse. Les couleurs sont très hamonieuses, subtilement dégradées autour des bleus et des marrons orangés (jusqu’à la couleur des cheveux et de la barbe !). L’ensemble aurait pu aboutir à un camayeux un peu terne, mais ce jeune homme a su, par le choix de la chemise à larges rayures bleu et blanches, briser la monotonie et insérer la touche plus vive qui anime tout cela. Bravo, vraiment bravo à lui ! that’s called a decent look…. Great look. Simple and sober but with lots of personality. The play with materials is also great. The relaxed tie 5 star! Oh how I miss living near NYC! Forget bars ladies. Just ‘casually’ hang out around The Armoury. I love how approachable he looks but is so well tailored and dressed. Looking friendly and approachable is a lost art.